Mountain bread wraps are my favourite healthy alternative to bread and other doughy wraps also the big winner for me is that they are preservative free not like most other brand wraps on the market. They come in all sort of varieties and are easily found in the wrap section in your local supermarket. But did you know you can make other things besides eating them as wraps? 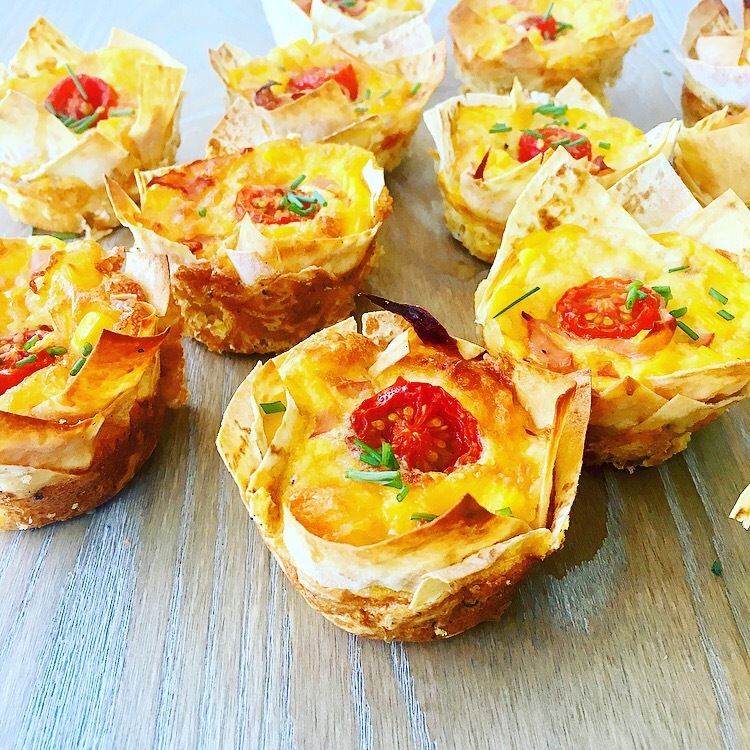 I have used Mountain Bread sheets to make all sorts of things from pizzas to enchiladas and this recipe of using them as casing for eggy cups or frittatas if you like. It gives them the outer crunch without all the butter and calories of pastry. You can use whatever ingredients you like in the egg mix, I used chopped ham, grated cheese, corn and tomato to make them kid friendly for my kid’s school lunches. You can add other cooked veggies like broccoli, pumpkin or spinach to add extra veggie goodness. They are super easy to make even the kids can help you make them. Grease a 12 capacity muffin tin with cooking spray and press one square into each muffin hole. Then repeat placing another square on top into each hole. Dab a little water in and around each case and bake in oven for two minutes then remove and let cool. In a medium bowl crack the eggs and lightly whisk. Add sliced ham and cheese and salt and pepper mix to combine. Bake for 25 minutes, remove from tin and cool on a wire rack before eating. They should keep in the fridge for 3-4 days or can be frozen note: that mountain bread may not retain the crunch if frozen. 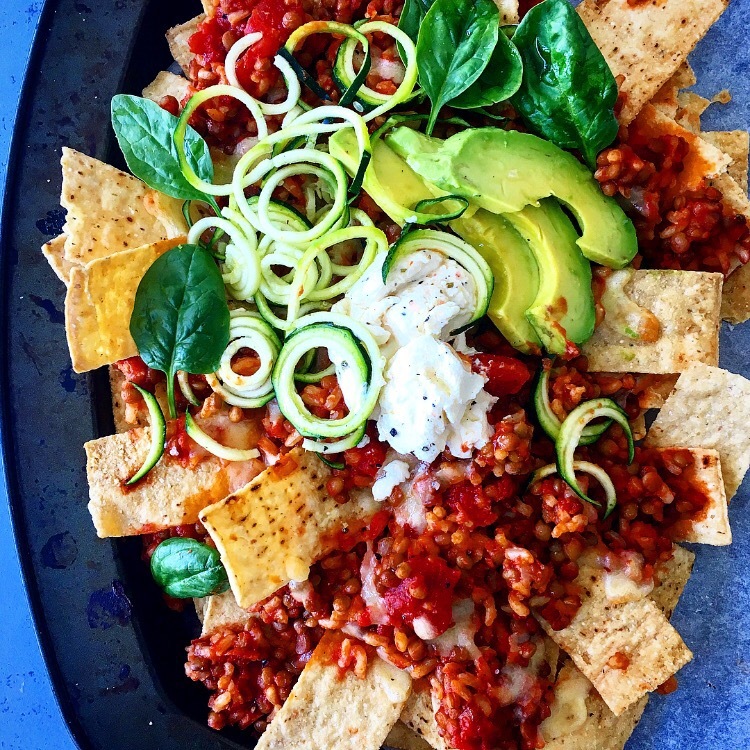 Did Someone Say Healthy Nachos? Is there even a thing? Changing some of the ingredients in your favourite weekend drinking snack or hangover meal can still be tasty without all the excess calories that you kick yourself for eating later on. Inspired by issue 6 Donna Hay Fresh & Light Magazine where she included some lighter more nutritious alternatives to the heavy, cheesy Mexican favourite was a brilliant idea and was too eager to try it out. Perfect for a lazy weekend in front of the Netflix wouldn’t you agree? *Warning this has a good kick of heat so adjust the hot paprika/cayenne to your personal heat levels Or omit it for a mild child friendly version. The leftovers of any of the lentil mix is also great for topping of baked sweet potatoes or on toast with poached eggs, as a stuffing in capsicums (bell peppers) or mushrooms, the possibilities are endless. Heat oil in a large frypan and add garlic cook for 1 min. School is back next week woohoo.. I mean wow that went quickly. I’ve quite enjoyed the sleep-ins well not having to be dressed, rushed and out of the house every morning. But like all good things they must come to an end and it’s back to reality, routine and the early morning chaos. My middle son starts prep (first year of school) this year and to say he is excited is an understatement. He is looking forward to the challenges and friendships and of course joining his big brother at school. It will be an adjustment for all of us and I hope I don’t get too teary but I can’t promise anything. He is my mummy’s boy and I’ve loved having him home with me. Now he will be out in the big wide world of school and I’m not sure how I feel about it. Excited for his next phase but also a part of me finding it so hard to let go. Sounds silly, but to me it is a big deal the next step in their little lives.They are no longer tied to you everyday and having mummy protect them from harms way. It’s more than just school work, they build their confidence and independence that will stay with them for years to come. It’s kind of a big deal! Enough of the emotional stuff I still have some days left to prepare myself. In the meantime I have started thinking of some lunchbox ideas to distract me. I like to pack fresh fruit, veggie sticks, rice crackers, sandwiches and some healthy snacks they are the usuals in my kids lunch boxes. I do like to make some homemade treats when I get a chance as I hate all the supermarket kids snacks that are targeted as “school snacks” but are mostly all filled with excessive amounts of sugar and still cheeky additives and preservatives. Still don’t know how they get away with it. Muffins are a great treat though making them without sugar can sometimes leave them underwhelming and bland which may come back at the bottom of their school bag. I love this recipe I found that does include a little sugar but unrefined coconut sugar, also is sweetened by grated apple also making it super moist, the added blueberries for extra fruity flavour and contains quinoa flakes for added superfood slow releasing energy . Well sounds perfect for getting them through the day doesn’t it.. Win for me, but was it a win for the kids? Happy to say the kids sampled them and it’s a tick from them too. They can be easily wrapped and put in the freezer, then just taken out the night before to pack in their lunch boxes. I will be posting more healthy lunch box fillers in the coming weeks. Hope you are ready for school to start I’m sure there will be many mummy coffee dates planned and leaps out of bed that morning from parents and maybe like me some happy tears. To make quinoa crumb combine quinoa flakes and maple syrup and rub together to form a crumb. Set aside for 5 mins before turning onto a wire rack to cool. Baking cookies is one of my favourite things to make with my kids. Letting them take control is hard at the start as my anxiety of perfection kicks in but I just have to let that go for this time. The smiles and excitement when they are measuring the ingredients, pouring and mixing makes me realise I’m giving them life long lessons and memories that they are not even aware of yet. Not to forget the best part for them not necessarily me as I am a clean freak, getting their hands dirty and having imperfect shapes and sizes to my dismay and cant help myself to fix a few odd ones here and there. As we wait for the them to bake the clean up begins not surprising they have bolted in need of a bathroom break then disappeared into space for this part of the fun can’t blame them. Once the cookies are done the excitement and anticipation on their little faces melts my heart to jelly, to them seeing their creations is one of the most rewarding moments, the bursting of confidence streams through and the look of accomplishment as they take a bite of what they have just made makes it all worth the mess. Now to keep their cheeky fingers out of the cookie jar will be another wishful task..